Byzantine period Christian burial caves, with one of the most remarkable rock carvings in the Galilee. The exterior and interior of the caves are richly designed. Shefaram (Shfaram, Shafa-Amar) is a Arab-Druze city east of the bay of Haifa, and the site of an ancient Roman and Byzantine city. 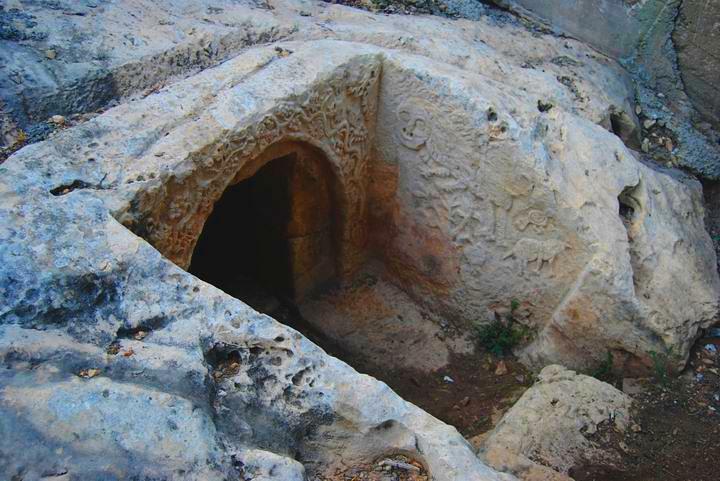 A number of Byzantine period rock hewn burial caves are located in the hillside facing the fortress. 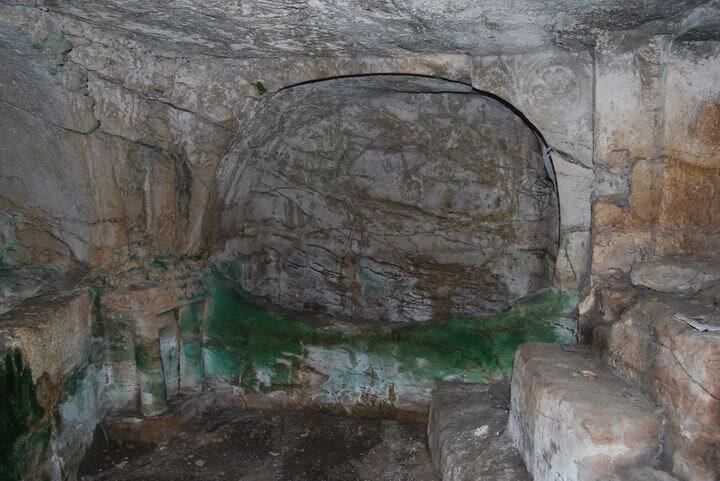 Three of the rock-hewn tombs were decorated on the exterior and the interior of the caves. 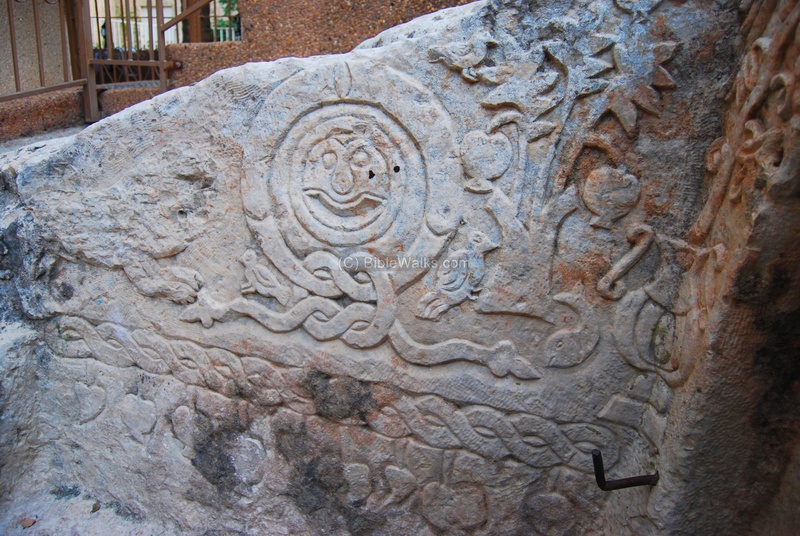 The ornaments includes lions, birds, snakes, floral motifs, crosses, amphorae and more. 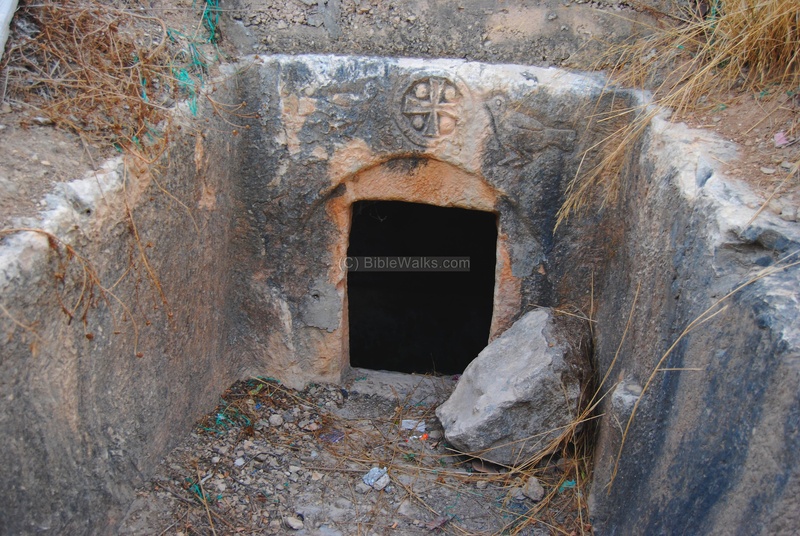 The tombs are located in the Christian section of Shefaram, exactly south to the fortress of Shefaram, on the steep north hillside above the valley. It is hard to find the tombs, as they are hidden in the yards of the houses. 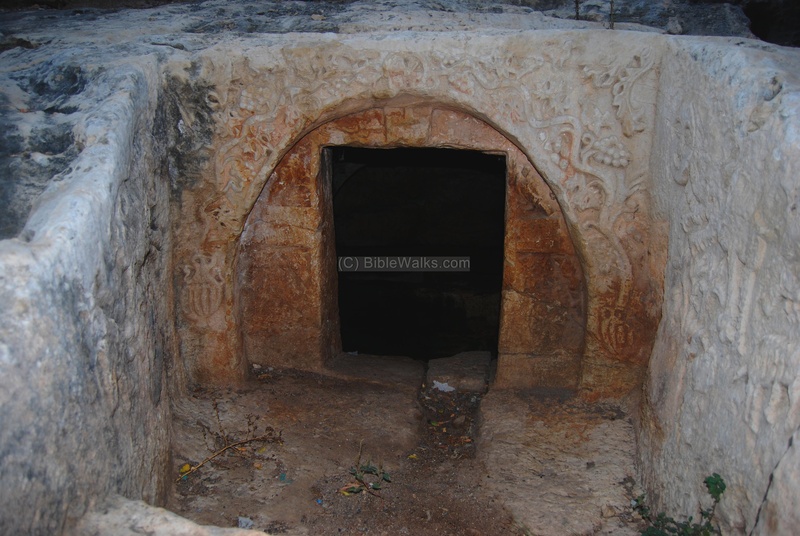 It took us three attempts to find these burial caves, but it's really worth the effort. Follow these directions: from the south main entrance (the street lights on the main road #79) drive towards the main circle. In the circle turn left on the main road (which was actually the route of the ancient way) towards the west. Pass the small circle (after 100M), and then at the next circle (road #317) turn back 100 M. Now turn right and up the hill (this is road #465). After 120M up the hill turn right into the street with the tombs. Drive about 100M - the tombs will be just below the road. For a history of Shefaram - check its detailed site. 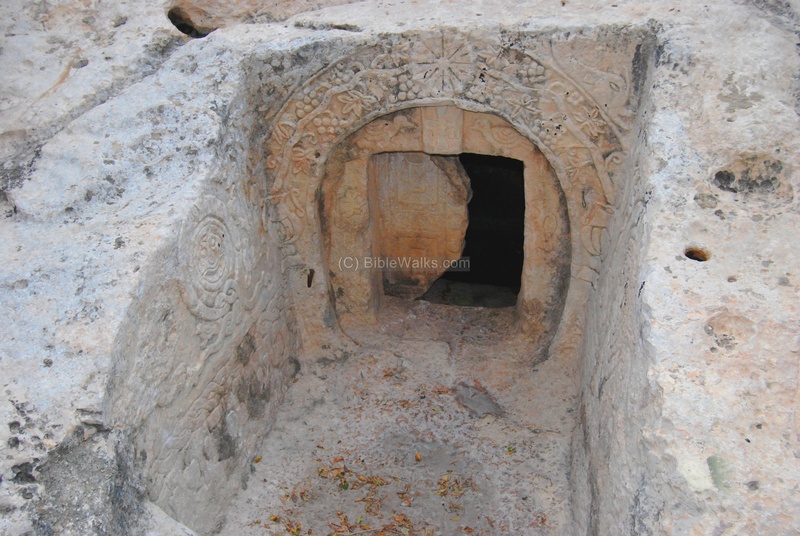 The tombs are dated 5th-6th C AD, and are Christian according to the crosses on two tombs. 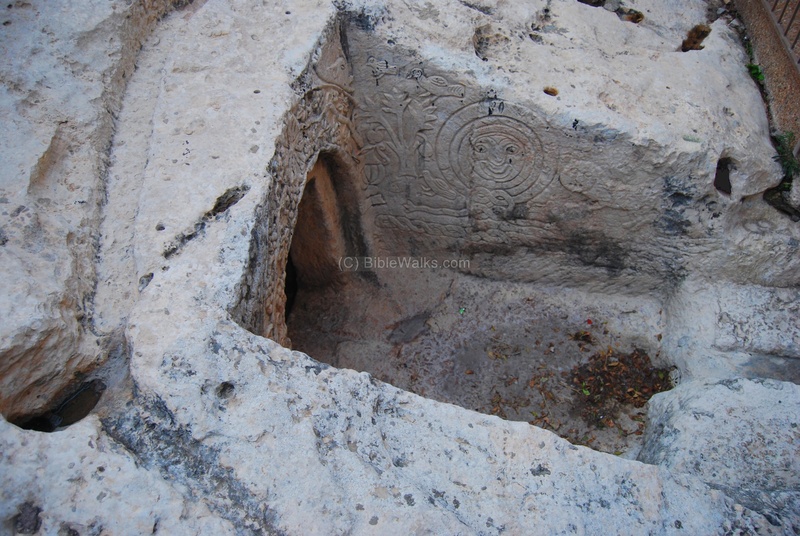 The motifs engraved on the stone are close to be Jewish symbols as well. 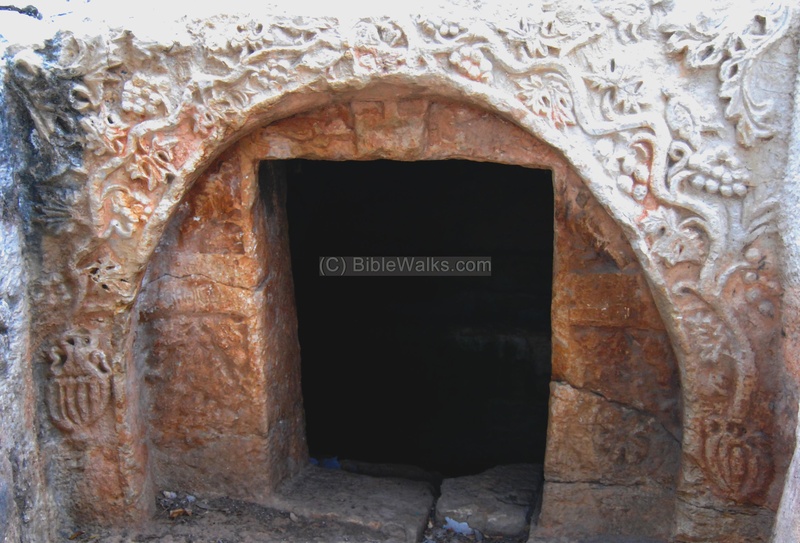 This can be explained by the fact the city was largely Jewish at the time, or the tombs may be earlier in time when both Religions were closer, or even due to the fact the caves were constructed by a mixed Jewish-Christian family. Note that the ancient Jewish cemetery is located on the other side of the ancient village. The tombs are presented in the order from west to east. A view of the western burial cave. A view of the facade of the burial cave. A detail of the facade: The door is decorated with grape vines growing out of vases on both sides, and they meet together, twining around a flower in the center of the entrance. Below this, and just above the entrance, two birds flank a small cross (although hardly seen in this cave). On both sides of the door (in the photo above) is a Greek inscription: "Lord Christ, save Sam ...?, and have pity on me and my children". This is the only inscription found in this cave cluster. A detail on the eastern wall, on the photo below, shows a lioness springing over a pomegranate tree and towards the entrance, and a young cub . 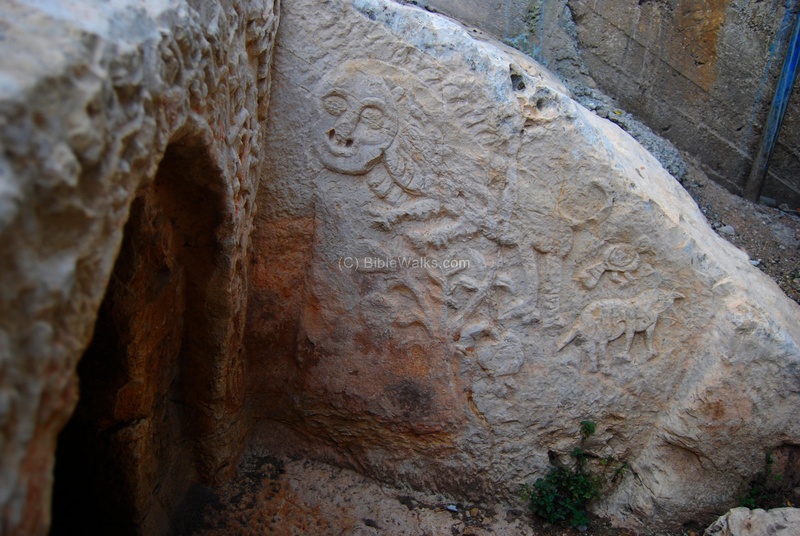 The western wall of the entrance shows the same motif: a lion jumping over the pomegranate tree and towards the entrance, a cub going away from the entrance (this is symbolic to burial practices where the old are buried and the young continue with their life). On this side there is an additional bird above the cub. 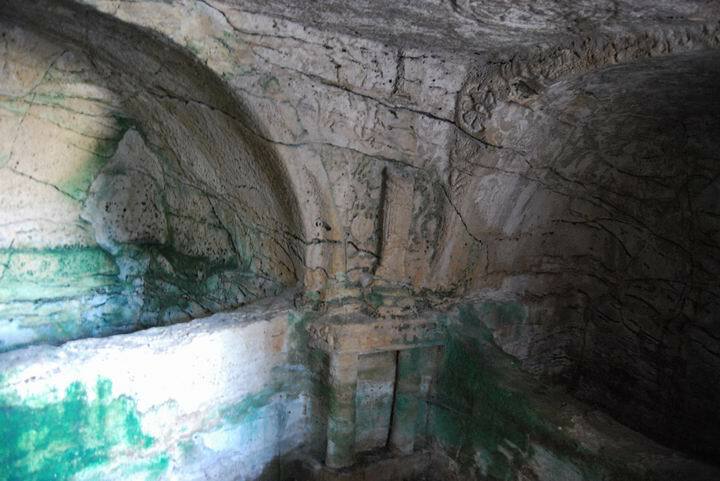 The interior of the burial cave has 3 burial resting places (arcosolia). It is heavily decorated on its walls with columns, amphora, birds, vines and floral motifs. On the upper parts of the walls and the ceiling are rosettes and crosses inscribed in wreaths. Another view of the interior, with steps leading to the entrance. 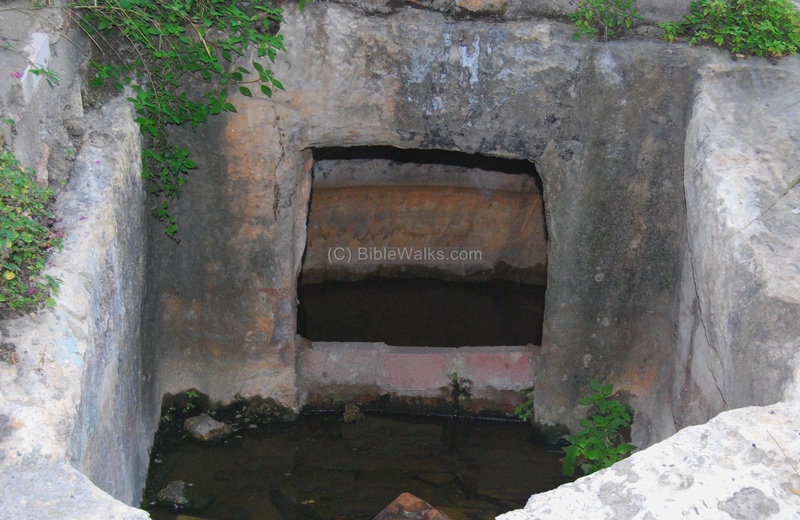 The next tomb has no decorations, and is partially covered with water. The third tomb is beautifully decorated. This is the facade of the burial cave. 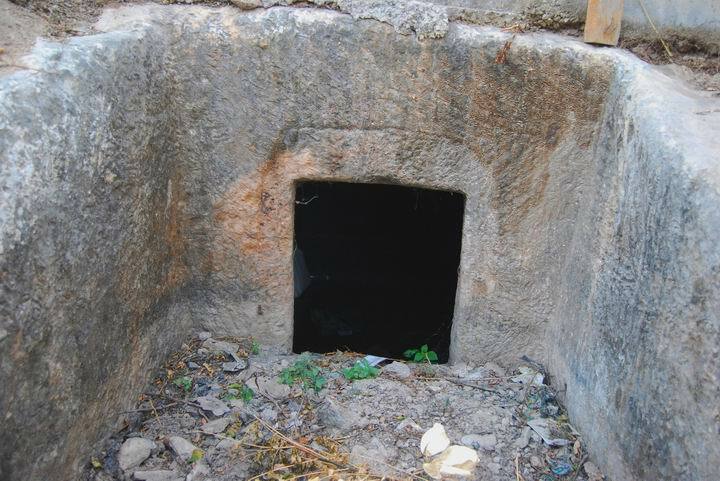 Here the stone door, which imitates a wooden door, is still in its position, although partially broken by ancient grave robbers. A detail of the entrance shows two birds flank a small cross just above the stone door. This motif is also used on cave #5 and #1. An Alpha and Omega letters appear on both bottom sides of the cross (the first and last letters of the Greek alphabet, representing that God is eternal - spanning the beginning and the end). 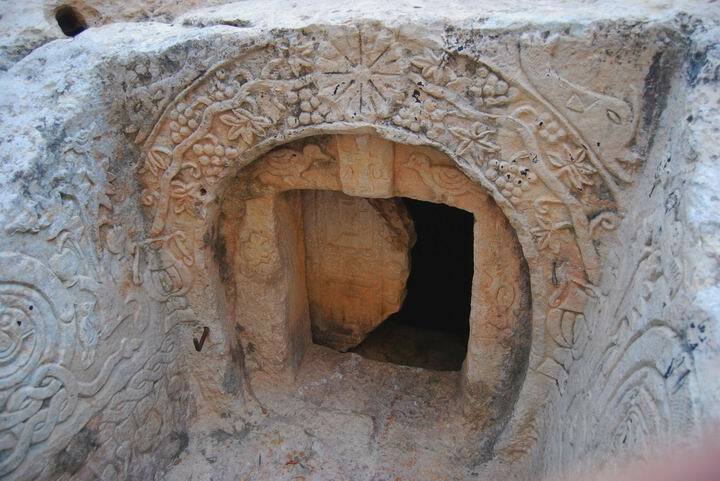 The door is decorated with grape vines growing out of vases on both sides, as in cave#1, and they meet together at a flower rosette. In the corners are dolphins. A detail of the eastern wall. 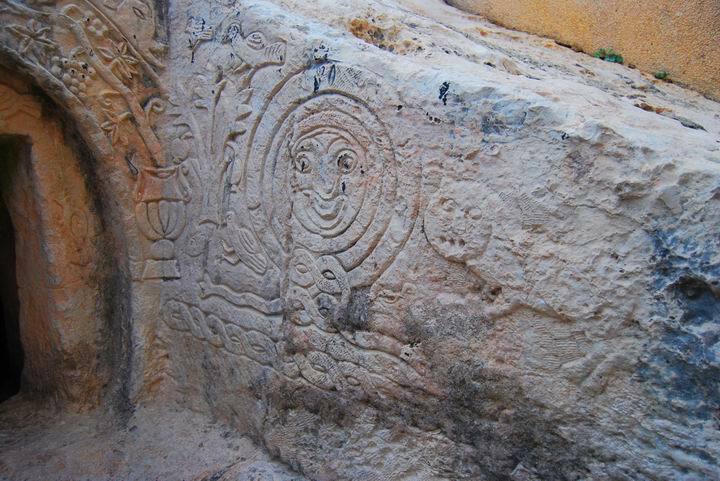 The decorations include a lion, trees, birds, amphorae, fish, and a large face (mythological symbol?) within a knot. 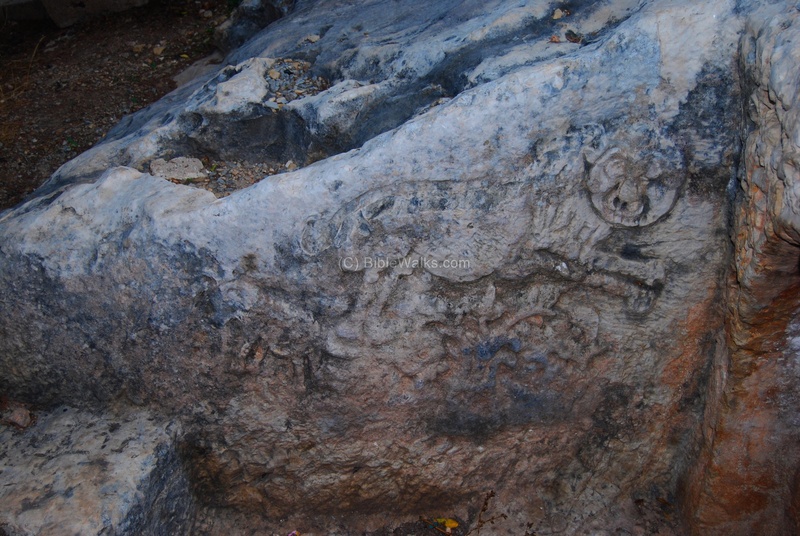 The eastern wall has a similar decorations, but with a lioness. A detail of the eastern wall. This tomb is also not decorated. 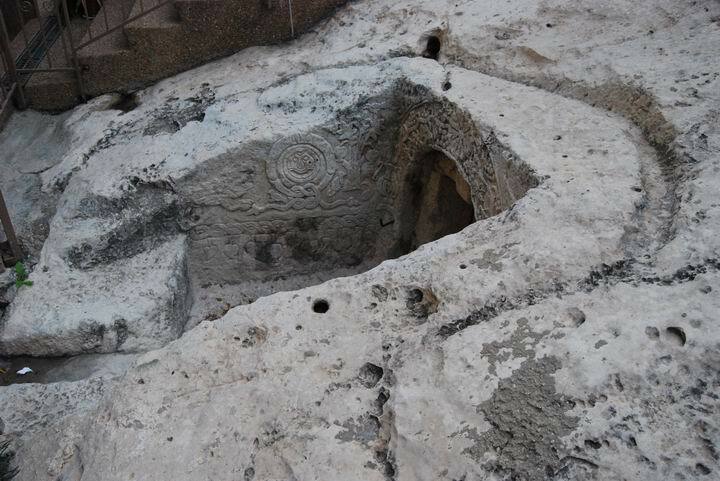 The tomb has the same motifs as tomb #3: two birds flank a small cross. 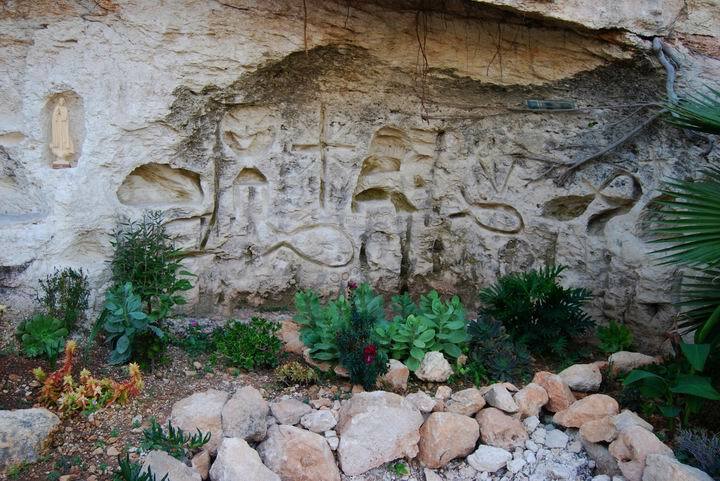 In a cliff just above the last tomb is a modern rock carving with a small garden and the status of the virgin. It is a nice corner, which used an old burial cave as the base of the set.